With fall right around the corner, that means the trees will be changing color and the days will get shorter and colder. It will also mean that we’re only a short time away from leaves falling off the trees and into our yards and gutters. So to keep those leaves, twigs and other plant life out of your gutters, invest in gutter guards. Along with leaves, trees branches start to become more brittle as the weather turns cool, meaning that small twigs and sticks can easily fall on our roofs and end up in our gutters. I turn, this can lead can lead to water building up, damaging gutters from the extra weight and even leading to roof issues in extreme cases. Gutter guards can keep these items from building up and damaging your gutters and roof. They are placed over top of your gutters and have small perforations that allow water to pass through while blocking leaves and other debris. 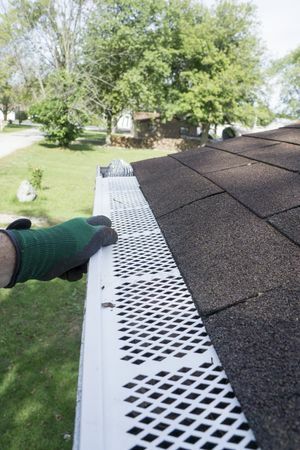 Having gutters guards installed also helps turn cleaning out your gutters a chore of the past. With these guards keeping debris out of your drainage channels, you won’t have to climb up on a ladder and spend your day picking out waterlogged twigs and decomposing leaves. You could instead spend that time enjoying other things the season offers, such as fall festivals or the start of football season. Installing gutter guards can also help prevent possible damage from blockages. In turn, this helps you save money on gutter fixes or even roof repairs from water damage. Roofing by Bruce offers numerous roofing services throughout the Pennsylvania Poconos, including roofing installation and gutter maintenance and repairs to keep your homes roof in great shape. If you would like more information, give us a call today at 570-424-7250!